I LOVE PNW! This place is marvelous, especially for a raw vegan! 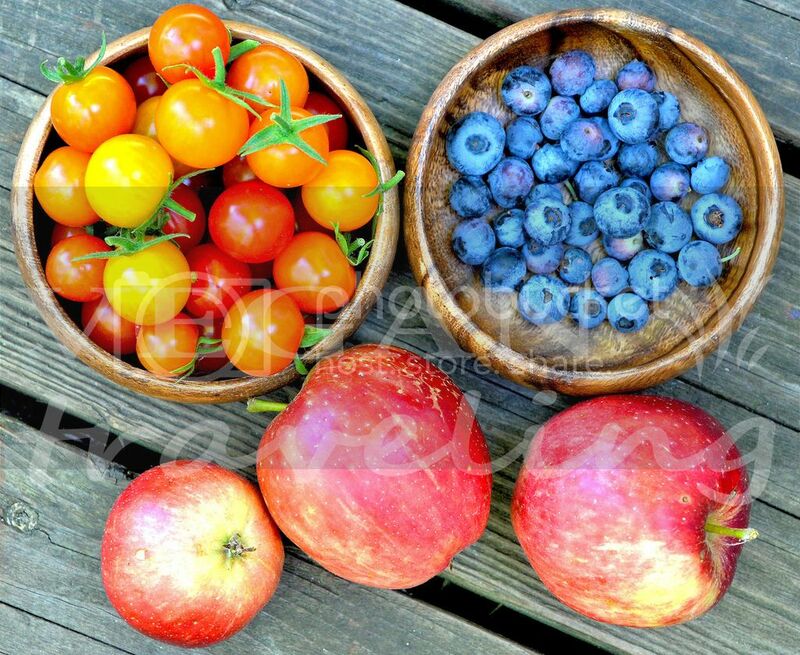 Cherries and apricots are ready end of May, strawberries are available all summer long, and now tomatoes, blueberries and apples are ripe. A dream, no? And the best part is the latter three are from our own personal garden 😀 I collected a whole mini container of yellow and red cherry tomatoes today and they of course cannot even be compared to the store bought – just so sweet and yummy. Blueberries though are not very good – with the drought this year they are pretty dry and almost bitter. But still our own, so I happily munched on them. And apples – we were so lucky to get a house with two apple trees – one with regular granny smith apples, and the other tree with red fruits that are pink inside. Still not sure what they’re called, but while researching I figured that there is a pretty large variety of pink flesh apples here in PNW. I love you, Seattle! 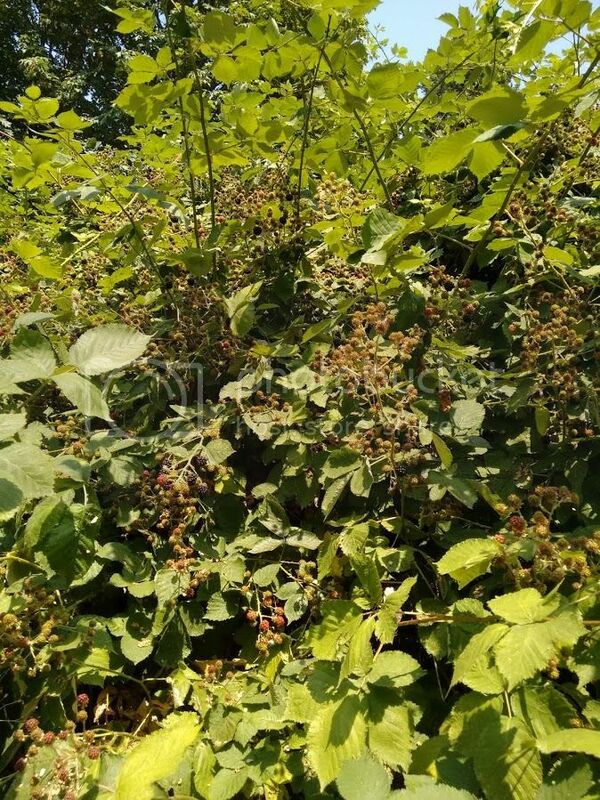 Another plant that makes me super happy in PNW is undoubtedly local wild blackberry. They grow in every single corner, every hill and where ever they can along the roads. And they have tons of delicious berries that nobody picks for some reason. Not facing any competition I regularly forage on those, every time feeling like a bear. I’m in progress of breaking the 7-day Juice&Smoothie Challenge/Fast and super happy about it! 😀 So excited to be able to chew on this beautiful fruit and veggie abundance instead of permanently liquefying them haha. Now, on a serious note, this Challenge was amazing and so were the effects of it. Compared to the previous fasts (water/dry/juice) when I had much more detox to do, this time the fast went much more smoothly and I only had slight detoxification on days 2 and 3 when I felt somewhat tired and could only walk instead of jogging. But the recovery happened much faster than in the previous fasts and starting from day 4 I was already back to my normal jogging, and from day 5 on started jogging, biking and doing abs workout at home. See the list of Overall Results from this fast in my previous post. After a week of only consuming liquid foods your body needs to go back to regular food step by step. That is why during at least the first day or two you should be eating predominantly mono-meals and the portions should be very small. Eating mono-meals means that each meal should only include one type of fruit or vegetable and there should be a minimum of 2 hours between the meals. If you’re not a raw vegan, then I would strongly recommend going raw vegan of at least one week after the fast. That way you’ll ease the stress on your digestive tract while switching back onto foods and extend the detox further. After one week of raw veganism you could switch back onto cooked vegan/vegetarian foods and ideally stay on this lifestyle because it’s amazingly beneficial for you! But if not, then definitely stay on vegan/vegetarian food for at least a month after breaking the fast. Your body will be very grateful for this and you’ll ripe all possible benefits such a further healthy weight loss, continued high energy levels, glowing skin, increased stamina and positive attitude non-stop! Day 7 of Juice&Smoothie Challenge! Final day!! So glad to say I did it! skin looks much better – it’s glowing! I’ve been doing juice fasts for over a year now and every time I’m amazed with how great these ‘fasts’ are, how much positiveness they bring and with how little effort. I really do recommend this kind of experience to everyone! It does not matter what type of food you eat and what is your current weight – you will benefit from such ‘fast’ immensely! However if this is your first time and your lifestyle is conventional, then you should definitely check out my Juice/Smoothie Fast Recommendations. Following those tips will ensure smooth sailing for you during your first raw vegan liquid cleanse and will help you achieve maximum detox while doing it! 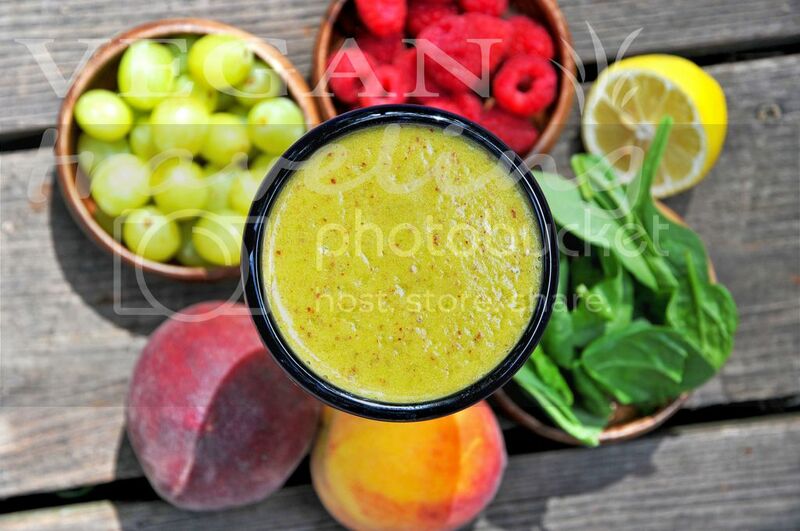 And don’t forget to check out the Juice&Smoothie Challenge Tips! Wash, peel and cut larger ingredients into small pieces. Blend in Vitamix or any other blender on high speed. Day 6 of Juice&Smoothie Challenge! And feeling even lighter and more energetic today. Weight released as of today – total of 5 Lbs from the start. This was not really needed but always nice to get a tad lighter! The best thing about juice/smoothie fasts is that no muscles are lost during weight release and this is a huge deal. Most extended water fasts and especially dry fasts are extremely beneficial practices, but they always make you lose some muscles along with fat tissue and this makes people look very exhausted by the time they break those fasts. That is why compared to those two types of fasts, juice/smoothie fasts are much milder and will make you not only feel great, but also look even better by the time you break such juice/smoothie fast. 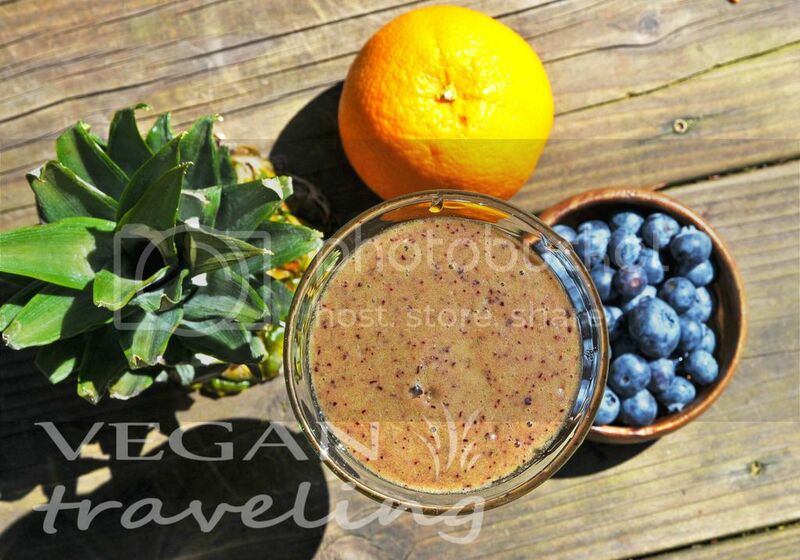 If you are not ready to do the complete Challenge, but still want to participate – then just have at least one juice or smoothie per day, post its picture daily, follow me on Instagram @vegantraveling and tag those pics #vtjschallenge. We’re off to the Ocean today! Loaded the car with tons of fruits, greens and my Vitamix and headed out West 😀 Long Beach, WA here we come! Wash, peel and cube all ingredients. Blend in Vitamix or any other blender on high speed. Day 5 of Juice&Smoothie Challenge! Feeling amazing – started jogging in the morning and noticed how easy it is compared to the previous 2 days. Ended up jogging for 3 km today, and will definitely bike a lot at night. I’m back to my energetic self, yay, so everything is going very much as expected – like in all previous juice fasts. Weight loss is still at 4 Lbs total which is just perfect. As I mentioned earlier, there’s no drastic weight release happening during juice fasts. However all of the weight released will stay off you even after you break the fast. Wash and peel the ingredients. Place everything in a Vitamix or another blender and mix on high speed. Day 4 of JUICE&SMOOTHIE CHALLENGE is going great. Started the day with a warm glass of lemon water, as usual. The weakness that began on Wednesday is receding and I’m feeling much more energetic than yesterday. Still walking instead of jogging, but hopefully will do some biking tonight. Weight is releasing slowly – 4 Lbs so far, but I know this weight will not come back after this juice&smoothie fast is done. During a walk in local park I found plenty of the amazing (and super stingy!) fresh stinging nettle. Perfect timing! That’s exactly the ingredient I could use for my today’s juices, so I harvested quite a bit of it and was juicing nettle all day. Check out my post on benefits of this awesome herb. If you are not ready to do the complete Challenge, but still want to participate – then just have at least one juice or smoothie per day, post its picture daily, follow me on Instagram and tag those pics #vtjschallenge. Soak nettle leaves and stems for 5 minutes in cool water, then wash thoroughly. Make sure to use rubber gloves! Wash and peel oranges and lemons and cut into smaller pieces. Juice everything using a masticating juicer like Omega. 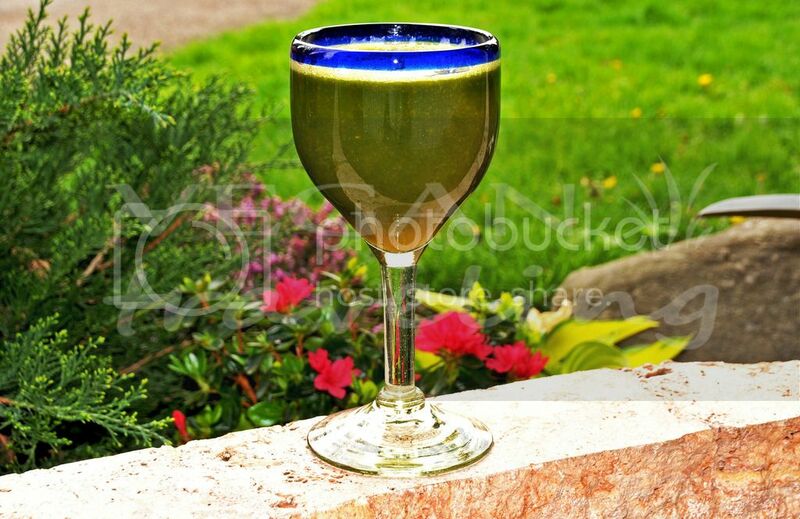 Unfortunately, centrifuge juices like Hamilton Beach brand, will not work for juicing herbs or will yield very little juice, so a cold pressing juicer is a must here. Compared to the previous two days, I’m feeling slightly tired – same thing I have experienced during my previous juice fasts. Based on my experience and knowledge, I know that this is happening because of a detox that my body is going through right now. When we feed our bodies with easily digestible foods such as juices and smoothies, our system doesn’t need to waste time and resources on digestion and is now able and available to start fixing any issues on a full-time basis. Giving your body a week to do this internal cleanse is usually sufficient to go through this whole process and achieve feeling energetic and more vibrant than before the fast. Coming back to elevated energy levels happens for me after the 5th day. Wash and peel orange and lemon if using, and cut into smaller pieces. 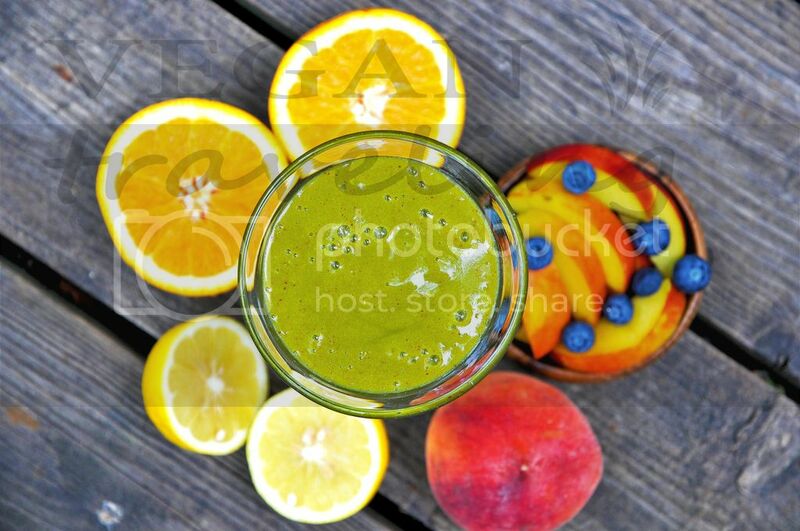 Wash spinach, grapes, peaches, raspberries, slice peaches. 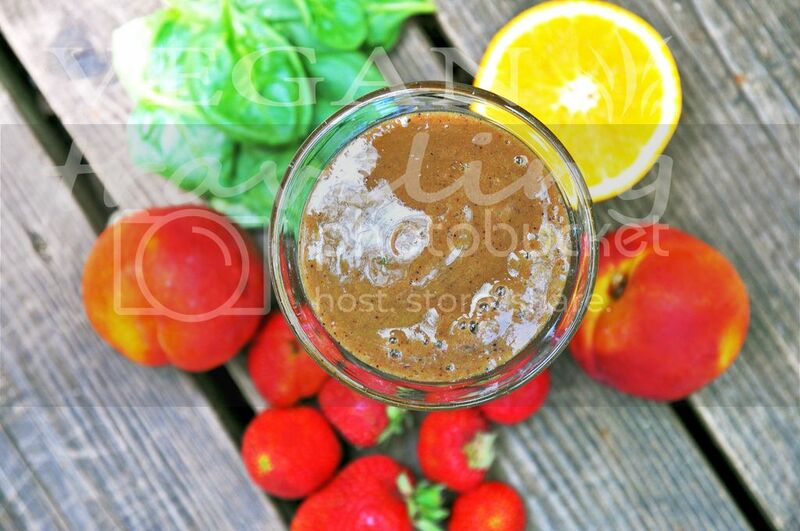 Place all ingredients into your Vitamix or another blender, add 2-3 tbsp water and blend on high speed. My day 2 of JUICE&SMOOTHIE CHALLENGE. Got rid of 2 lbs by now, while feeling happy, light and energetic! How amazing is that? 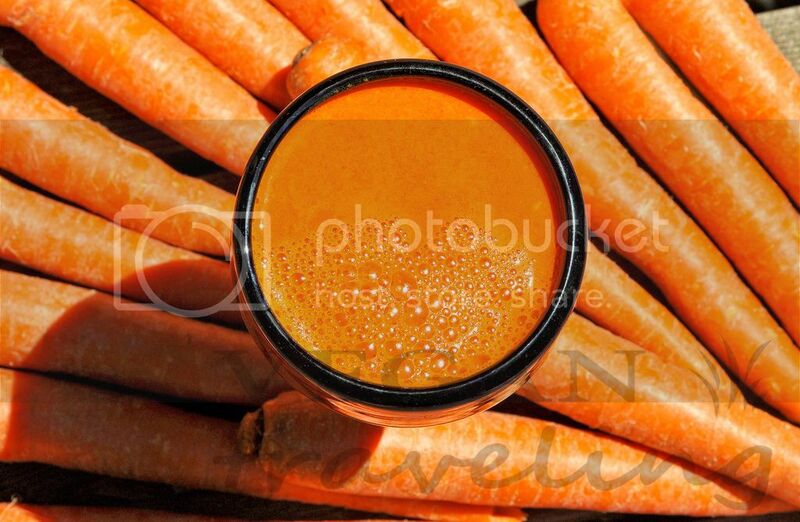 Delicious unlimited juices and smoothies all day, extra energy and getting rid of unwanted couple pounds? No diet in the world can offer you such fantastic results, but raw veganism! Overall, my fast is looking amazing as always, going strong! 😀 Just to clarify, for this Challenge you will have to make one type of juice/smoothie and have it as many times as you want that day. Hey guys! 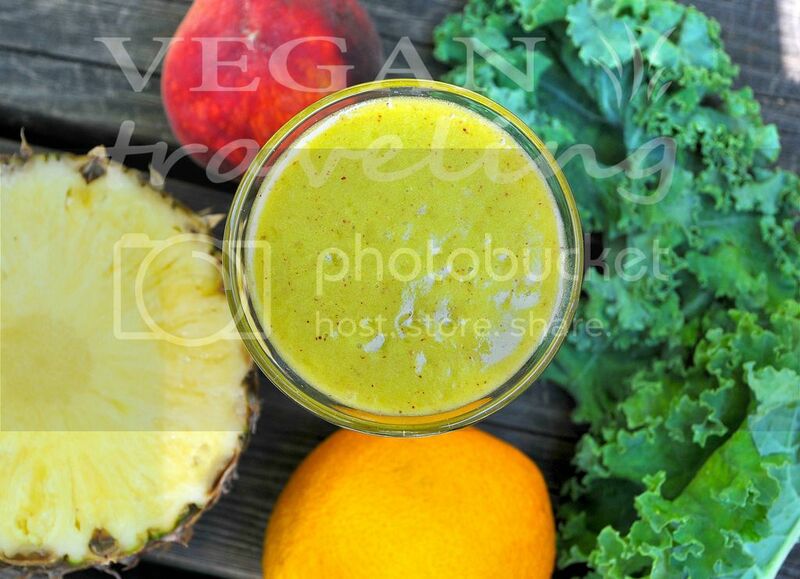 As promised through my Instagram account @vegantraveling today I’m starting my 7-day JUICE & SMOOTHIE Challenge. I do this kind of “fasts” regularly because it always gives me plenty of energy, feeling light and positive, as well as helps me get rid of unwanted 1 or 2 lbs as an added benefit. This kind of weekly challenges improves my digestion and metabolism. Just these things I mentioned altogether combine into a huge inspiration to repeat juice&smoothie fasts again and again. Went to our local farmers market today (I a Sunday markets freak in case you didn’t notice lol) and now we have an amazing fruity and veggie abundance in our fridge. Got especially amazing peaches and nectarines, yum! But now we have to make sure to consume all that greens and peachy cornucopia, so I’m thinking to have a 7-day Juice & Smoothie Challenge! Looks like a great idea to me, because smoothies are healthy, they use lots of greens and fruits, veggies can be juiced, and plus the weather is actively cooperating – currently it’s 36 degrees Celsius (which would 96.8 Fahrenheit 😉 ) and I’m permanently feeling tired and worn out. So Juice & Smoothie Challenge it is! Yay 😀 I’ve done many of these previously and every time the results are great: my energy levels at the end of the “fast” are higher than before, I feel light and happy, and plus I always get to get rid of those annoying couple pounds, all of which make such “fasts” into an amazing experience! There’s no restriction on how much juice or smoothie I will have, so I’ll drink as much of the same juice/smoothie as I feel like! 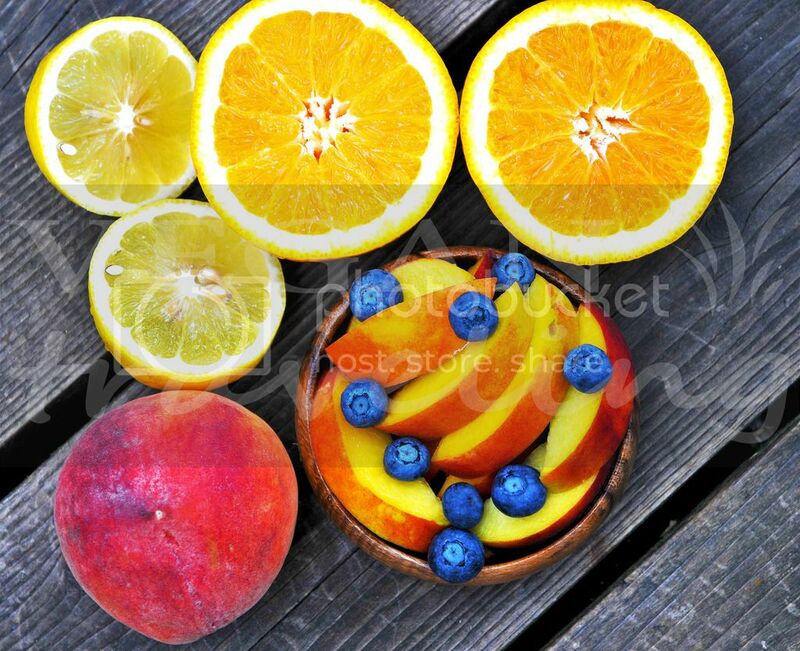 🙂 It’s very hard to overeat natural food like fruits and veggies, and yet even if you eat too much there’s no harm as it will all digest perfectly. One of the reasons I love raw vegan lifestyle! 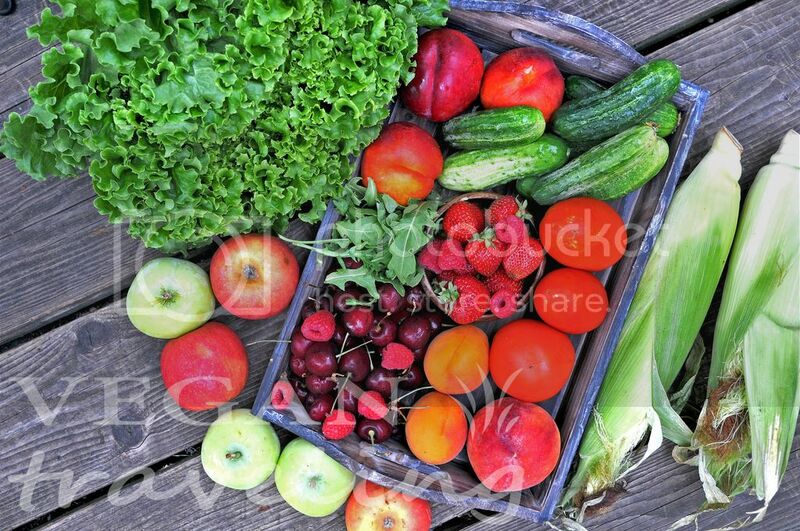 If you’re unfamiliar with raw food lifestyle and are planning to join me for this extended Challenge, then you might be interested to read my post on How To Maintain Raw Vegan Lifestyle. In a way you’re going raw vegan for these 7 days and those tips I have compiled from my own experience will be very helpful to you. As for today’s snacking – it’s going to be loads of fresh amazing farmers market peaches, blueberries as well as some citrus!